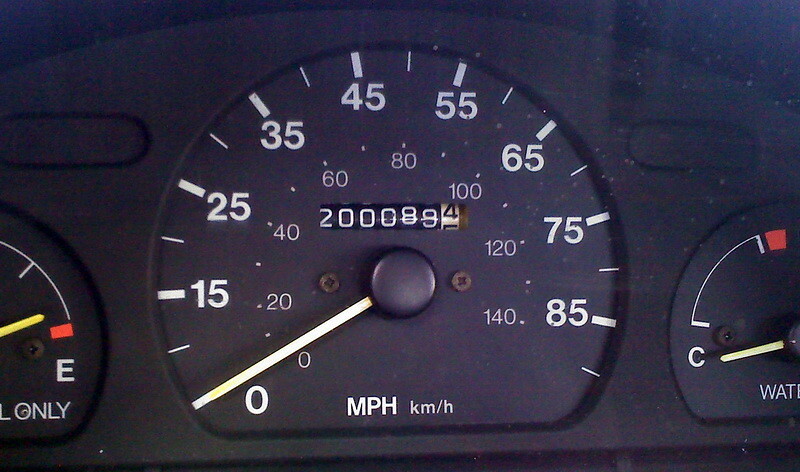 My 1994 Geo Metro just passed 200,000 miles. It is now officially a zombie-car. If it dies anytime in the next 6 months I am hosed. Without transportation three people will lose their jobs and one of those three will also have to drop out of college. Lisa Blount, star of one of the greatest horror films ever, dead at 53. There’s a great horror story to be found in this. 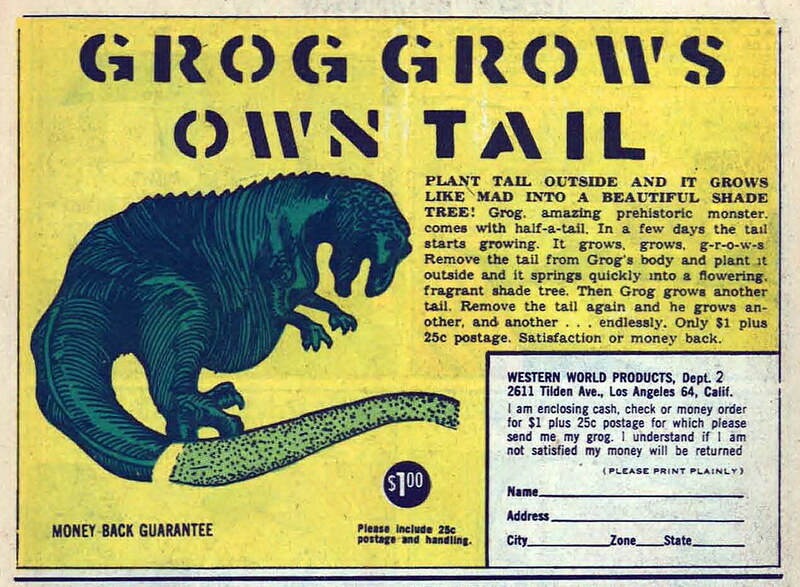 And you can’t beat those pre-graphic arts programs days of cutting, pasting and stenciling your own home-made ad copy. 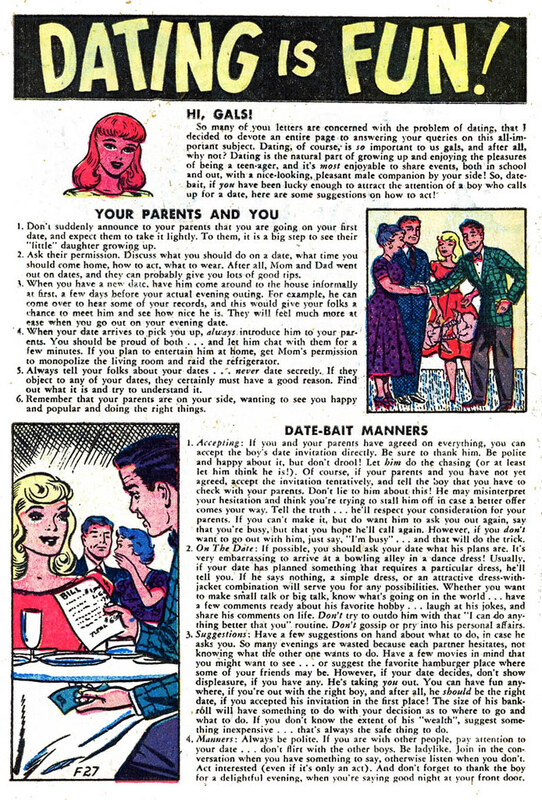 From Teen-Age Hotrodders #4 (1963). Hayley Mills in the grip of the Tentacle Men. 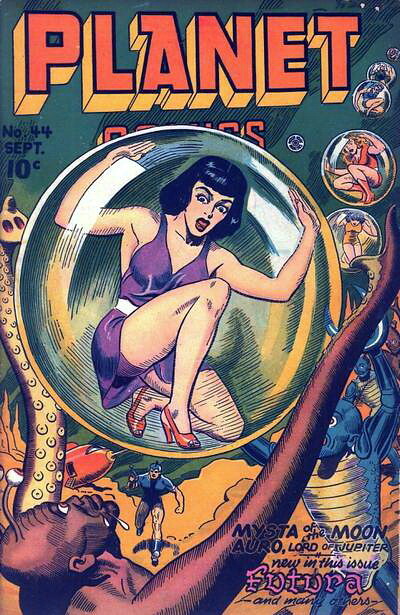 Planet Comics #44 (Sept 1946) brings a multi-part story and some continuity to Mysta’s story. This chapter also gives the reader some insight into the politics of Mysta and the society in which she lives. Recognizing the need to appear friendly and cooperative, Mysta agrees with the Science Council to host a student (an ambassador and perhaps spy) at her fortress for a year. The student, Bron, will learn science at the feet of the “Queen of Science” and presumably go back to his own world wiser about the application of dangerous technology or at the least as an agreeable public face of Mysta’s benevolence. 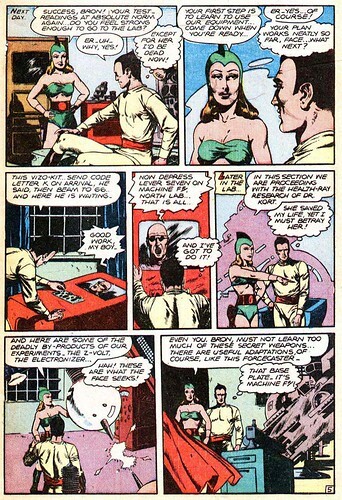 It appears the Science Council is using Mysta who is also not above using them and any propaganda tools she can apply. Mysta recognizes the power of not only atoms but good public relations as well. 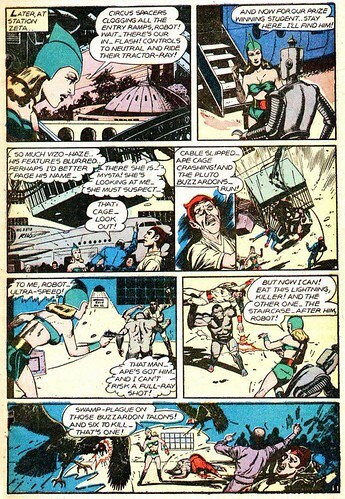 Unfortunately an old enemy interferes with her plans with designs to wrest control of forbidden sciences from Mysta. 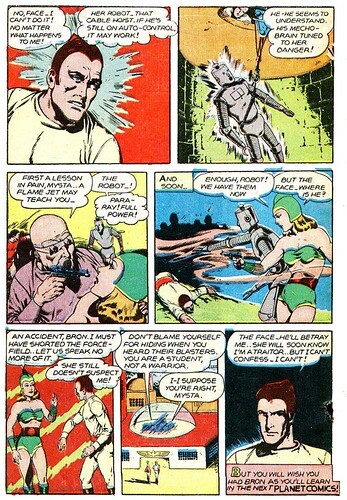 The villain of this chapter, The Face kidnaps and replaces Mysta’s student with a ringer. 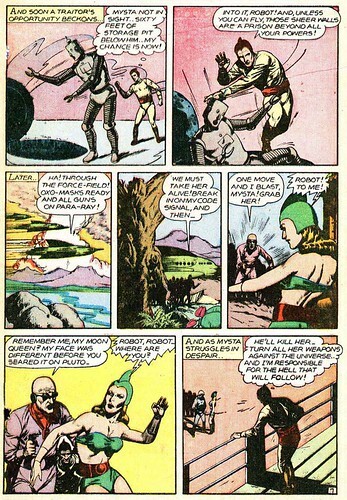 That the villains fool Mysta and everyone else is somewhat odd. Not being able to verify someone’s identity seems somewhat unlikely but human society is probably still fragmented and rebuilding from the the Anti-Science Wars caused by Mars. It could be that even the most recovered worlds would have official databases that are easily compromised via corruption or carelessness. That a thriving space pirate and vast institutionalized criminal network exists under Mysta’s watchful probes lends credence to the theory. 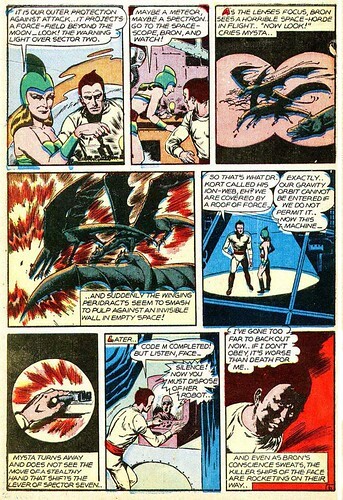 Using threats to return Fake-Bron to the living Hell of the “Kafka Colony” he rescued him from, the Face plans to have the Fake-Bron betray Mysta. It isn’t clear what the Kafka Colony is but a clue might be found in the name. It may be a prison or place of exile but the name may also be ironic in nature. If not, it says a lot about how a rebuilt human civilization is treating their prisoners of war or other criminals. Again, Mysta is keeping to her policy of non-interference in day-to-day politics and culture choosing to control dangerous knowledge instead of righting wrongs and improving the general quality of life. Also, not an animal lover. 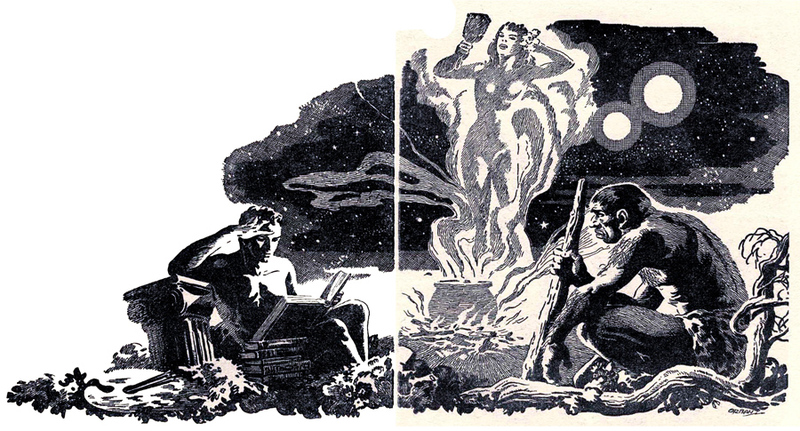 From The Two Shadows, published in Startling Stories (March 1951). 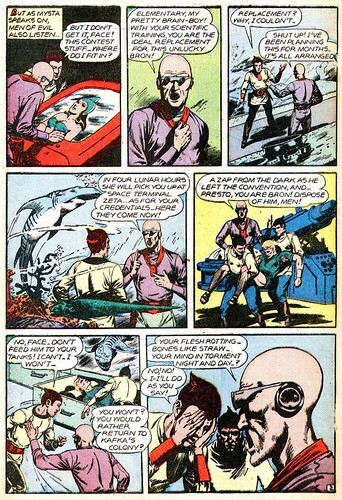 Story by William F. Temple with art by Orban.